Chevrolet Corvette - $51,865, yeah buddy! With Rachel's 8 prizes totaling $91,088, that's THREE "Shane Stirlings" this season! Can she pull yet another "Shane"? Also, later in the season, I hope Rachel breaks $20,000,000 just like Shane did. Tamiko Nash was not the only Price model in the 2006 Miss California USA Pageant. Season 33 model Ashley Coleman also participated in that very same pageant. Tamiko has appeared on a game show before: Deal or No Deal, April 12, 2006 (was intended for the 14th). She held case #3, which also was and still is held by former Barker's Beauty Lisa Gleave. Your 23 prizes total $165,497. CoG: Simple: 95 was screaming GOING! Hole: Nice to see you, Mike nailing the $500 Bonus and making the simplest putt ever. MYM: I had a feeling the blender was $49. Secret X: I figured the remote was $25, and we have the 1st wipeout since 2/6/06. SC1 Covers the car only. SC2; Darn Mike you went over, but you still had a great time. By far the best show in the Drew era. I'm enjoying Drew more and more every day. I think I can say truthfully that I've fully accepted him as the new host. I knew that the sixth week of tapings had introduced Make Your Move, Coming or Going, and Hole in One, but I didn't know the fourth game and had kind of assumed it was Bonkers. I was pleasantly surprised to see Secret "X". The new cues on this show did absolutely nothing for me. They're not even memorable like the '03 package -- I couldn't tell you how a single one went. Drew did a pretty good job coming up with his own style for Hole in One. That aside, it was nice just to see a grocery item/car game after all this time. I see they've changed the money win graphics again. These new ones look a little better than the Pricedown graphics from the first six weeks. Make Your Move was probably harder today than it's been in several years. Drew called the asterisk on the Big Wheel carpet "the Goodson mark." More proof that he's done his homework. Hey, Mike! Wuzzat you on the show today? Good job, man! I guess it's natural that 2 weeks after the first block of shows, there would be more pricing games into the rotation, but 4 "new" games still seemed like a lot. That's because this is the December 14 episode. The "new" games really don't appear until the seventh week. COMING OR GOING- waaaaayyyyy too easy. Dude, it's Coming or Going. It's always easy. I'm really disappointed that there was a desire to add yet another new package of cues. DREW72: when did we get to see the Race Game curtain today? We didn't get that much during the closing (even the extended version on Innertube), unless I missed something? "Whether you believe you can or you can't, you're right!" It happened during one of the come on downs. Hole: Too bad about Drew's inspiration putt. Michael, I have to say Congratulations on such marvelous playing and I hope you'll enjoy your Mustang Convertible. Very well played. MYM: That was tricky. Heck, I didn't expect the motorcycles to be around $8K. Secret: Luck just wasn't on her side. Showcases: Loved Brandi in the "Fear of the Dark" showcase. That Corvette really was a surprise and it made up for RU's bad luck today. They didn't get much on camera during the closing, even on innertube. I don't there was a ceiling to audience shot and even on the extended innertube, rich didn't get in there either. Must have been a rushed closing. One thing I noticed during the intro was that the "virtual lightbox" in the intro didn't seem to reach the edges of the screen today. I'm not sure if this is something that I just haven't noticed previously or if it's a glitch. Oh, and the shot of the race game curtain was on the second calldown. Damn, 4 new games! Awesome! Slowly but surely, we'll get a full rotation! It's funny, cuz I just finished watching it, and there are a bunch of little things that I've noticed about today's show, that I wanted to mention, and they were already mentionned in other posts! Oh well, still, here they are! 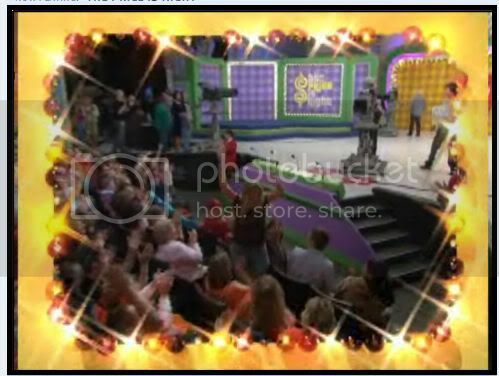 - The TPIR logos on the spotlights we saw during the opening. I think it's a nice touch. - The Goodson Mark? I like it! Like it a lot! - The new graphics for the SCSD is also used for the total winnings at the end of the show. Personally, I liked the one we saw since the beginning of the season more than this one. It just feels awkward to me. - Even on Innertube, we didn't get to see Rich today at the end of the show! But I loved how they allowed her to sit in her car and celebrate! - I dunno about those of you who watched it on Innertube, but mine played without commercials at all. One part finished, a 2 second pause, and the other one started! If only it could be like that more often! Another great show. Hope to see more new games soon. See y'all next week, it's my pager week at work, so no office during the day! I'll be in chat for some CSS!! CoG - Easy setup as usual. Hole - Too bad about the first "Inspiration Putt" for Drew. That's OK, Michael didn't need it! I had the first three items right, but then it was a crapshoot from there. When was the last time someone made it to the front line in this game? Bob's Bar - This was a toughie, but I went with the dinette. MYM - I thought the setup was pretty easy. I called the motorcycle price right away, and then figured 49 was a more attractive price for the blender than 32. Secret X - I'm still trying to figure out what she was thinking... Even if you have no clue on a price, going with one that ends in 0, 5, or 9 is generally good strategy that would've paid off here. Dice - Some very excellent rolls today, and the odds did not fail. I was worried on that third number though. SCSD's - I also noticed and appreciated the "Goodson mark" reference. Did anybody else notice Drew mentioned twice about the wheel being the original since 1975? I think Drew is taking a little more ownership on knowing some of the history of the show, which is great on his part. Showcases - Michael's bid was right around what I thought ($24,500). I was even lower than Lisa on her bid...trips in a showcase always mess me up. I'm glad she won, as she seemed like a very excitable contestant. Drew seemed to do pretty well today. I especially like that today he was varying some of his standard lines at the throw to commercial and Come on Downs, and also for the ticket plug. He also had some good reveals, and I liked how he stretched the reveal a little longer during Dice Game. I don't like the new SCSD win graphic font. Having the Pricedown dollar without the Pricedown numbers just seems weird. Does anybody else think it's odd that Drew talks about the $10,000 bonus before the $5,000 bonus during SCSD bonus spins? I wish he'd reverse that, as I think it's more exciting to present it the other way around. A great show overall. I'm liking Drew more and more with each episode, and I liked him in the beginning! I've noticed this several times in the past few weeks while watching Full-screen mode on Innertube. I wish mine played like that...although I think it may have skipped the first commercial which normally plays after PG#3. Gamefro: "Retired" host of TPiR at the University of Nevada, Reno (spring 2003 - spring 2008). All Innertube episodes have the edges showing on the lightbox. Why? I don't know, but I think someone ought to fix that. It's not a big problem, but it is a minor annoyance to see movement around the edges like that. My 2 questions to the folks at the show are why couldn't they still use the real lightbox? and if not, why can't they just "zoom in" a little more on the fake one? Hole in One or Two: Loved it! Drew's inspiration (and that's a bit of a stretch) putt actually almost went in. Just a little hard. Although, I think his technique might classify as cheating on most golf courses. Also, Drew's golf voice was amusing. To top it all off, perfect pricing and a perfect line 6 putt complete with a $500 bonus. Dude, you rock! Barker's Bargain Bar: I had no idea on this one. Very low differences too. Make Your Move: I was clueless on this one, but I had a feeling the 2 smaller ones should have been switched once they were put into place. Secret X: I would have had both X's. Bad luck on this one. I liked Drew's "Goodson Mark" reference. Nice one, Drew! Am I the only one who thinks MYM clashes with the new turntable? New graphics, not really an improvement if you ask me. I missed the showcases so shame on me. I'm with Gavazzi on this. More and more every day, I think that Drew is really making the show his own. CoG: Nice way to start the show with an easy win. Hole in One: Mike, I loved the expression on your face when you saw the Mustang. And I loved the hushed commentary during the putt. Barker's Bargain Bar: Anyone notice that Laura's shirt had both Bob and Drew's pictures on it? A nice tribute, and fitting irony. SCSD #1: Not a fan of the new $1000 graphic. Make Your Move: Was it me, or was there a speed-up when Deborah changed her prices the second time? Secret X: Major, major bummer. Dice Game: I think Drew assisted Michael by telling him he was "going against the odds" during some of the game. But I did like his dancing to the PIR theme when he threw to commercial. SCSD #2: Lisa deserved the wins after what happened to her in Secret X.
Showcase #1: Brandi is quickly establishing herself as the show's lead actress! From vampire to corpse bride, she can do it all! Showcase #2: Walking on a treadmill in high heels?!?! I'm glad Rachel didn't fall! Nice to see Lisa win all of those prizes today. Bummer for Mike, though, with the small overbid--but you still won a car in Hole in One! Overall, great show--and nice to see the best contestants of the day get through to the showcase round! P.S. For some reason Innertube plays the very start and end of the show very slowly. The audio is slow and broken up at first, but then progresses to normal speed after a minute or two. Anyone else notice this? We need to remember that this was one of the first shows taped. So, the Pricedown money win graphics are what's being used now. You're likely going to see a lot of bouncing around in the graphics department until they get on a more logical taping schedule.